The Committee on Individual Freedoms and Equality, set up in August, will present its recommendations on Feb. 20 to the president. "The issue of the right of children to add the title of their mother has been discussed ... All discriminatory laws in the family space and public space are included in the commission's tasks." The committee will present two proposals on inheritance, one providing for full equality between men and women and a second merely allowing women to request parity, Tunisia's TAP news agency reported earlier this month. Wafa Ben-Hassine, a Tunisian lawyer and women's rights advocate, applauded the prospect of further reform but cautioned that new laws must also be implemented on the ground. A 2017 law criminalising domestic violence, harassment in public spaces and pay discrimination also requires Tunisia's government to provide services to assist survivors, but did not make provisions for funding them, Human Rights Watch (HRW) said. "The law ... means little if not backed up by real resources that address root causes of violence," Ben-Hassine said, calling for doctors to receive training to detect signs of domestic violence and for schools to teach gender equality. Tunisia's religion-based personal status laws - which govern marriage, child custody, divorce and inheritance - are among the most progressive in the region, according to activists. 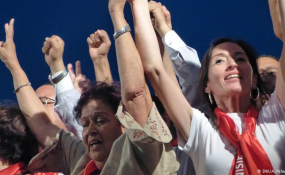 "Tunisia is already being seen as a pioneer when it comes to women's rights," Suad Abu-Dayyeh, a Middle East expert with the global advocacy group Equality Now, said in emailed comments.